Common sense is no longer common in the work place (and some lessons for Masonic Lodges). Probably the main reason why Scott Adams’ “Dilbert” comic strip enjoys the popularity it does is because it is a clever parody of the corporate world. It now appears in hundreds of newspapers around the world. As readers, we can relate to the corporate situations the characters are put in and the inevitable results. What is considered logical and practical is often sacrificed to suit petty personality traits. The underlying theme in the strip is that common sense is not common in the corporate world. I have assembled a list of items as found in business and compare and contrast how they should be applied in practice (common sense) versus how they are applied in reality. This provides some interesting insight into the philosophy of our corporate culture. Who knows, this might be nothing more than fodder for Scott Adams. Common Sense: Impressions make a difference as people react to our appearances. How we dress and act send subliminal messages to the people we meet and work with, but we must be wary of facade; an actor rarely assumes the characteristics of the people they portray. The same is true in business; looks will carry you for a while but you have to be able to produce results in order to achieve the confidence and respect you desire. Reality: Appearances and conduct are no longer considered important. A lot of managers are grateful simply because employees show up for work on time. Slovenly looks are often not disciplined accordingly. Our appearances also influence behavior; if we look bad, we typically lack respect for ourselves and others and treat them accordingly; looking better promotes pride and self-respect. Common Sense: Our perceptions, right or wrong, dictate our actions. Whether we perceive a situation correctly or not is irrelevant; we will act according to how we see a situation. Knowing this, we should make every effort to correctly interpret a situation so we make the right decision and take the appropriate action. Reality: We see only what we want to see. Little effort is made to clarify a situation and act on impulses. Common Sense: The brain should be fully engaged in order to strive to achieve. Reality: Companies establish working environments that do not stimulate thought. They prefer to have human robots as opposed to encouraging people to exhibit a little initiative. Common Sense: The only good business relationship is where both parties benefit. The intent should be to create “win-win” situations where both parties prosper, not just one. This promotes cooperation and trust. Reality: Its a dog-eat-dog world out there. Most companies have little regard for vendors and customers, let alone partners. “Win-lose” situations are still the norm today. Common Sense: Talk and write to communicate, not to impress. An eloquent vocabulary tends to alienate as oppose to recruiting support for your argument. As such, it is important to know your audience. Reality: Pompous speeches using a seemingly cryptic language does, in fact, impress people. Your audience may not understand what you are talking about, but they will be buffaloed into believing you. Don’t have any new ideas? Just change the vocabulary and make people believe you have invented a new idea. Common Sense: All companies have a culture, a way by which their people think and behave. In order for new employees to succeed, they must adapt to the culture or face rejection (e.g., people refusing to work with them). Reality: New people care little for the thinking and behavior of others. They believe they know better and act like loose cannons. Common Sense: The customer is treated like a king. By providing excellent service, the customer will offer referrals (new business) as well as repeat business. Reality: The customer is treated like sheep. By creating bureaucracy, consumers have learned not to expect too much and realize objections are exercises in futility. By vendors creating an aura that their products are “state of the art,” people will react like Pavlov’s dog and purchase the latest gizmo upon its announcement (usually sight unseen). Common Sense: Business decisions should be based on sound logical facts, such as a Cost/Benefit Analysis with “return on investments” and “break even points.” People are typically not afraid of taking a risk if the facts are presented to them clearly. Reality: Business decisions are based on emotions with an appeal to the frailties of the human ego, e.g., greed, stature, perks, etc. Politicians and marketers have known this for years, which is why Government initiates actions based on polls as opposed to what is really needed. People are not afraid of taking risks since they know liberal government bankruptcy laws will bail them out in case of failure. Common Sense: If something is important, write it down. By doing so, we are providing the means for companies to carry on in the event of a catastrophe or a turnover in personnel. Reality: Rarely is anything written down, particularly designs as it is considered a waste of time. Without documentation, people such as engineers promote job security; e.g., they cannot be fired since they maintain the designs in their heads. Common Sense: Information is not synonymous with data. Information is the knowledge or intelligence required to support the actions and decisions of a business. People act on information, not data. Data is the raw material used to produce information. Consequently, data should be cataloged so that it may be shared and reused to produce the necessary information. Reality: Information and data are treated as being synonymous. Rarely is data shared and reused outside of a single computer program. As a result, data redundancy runs rampant in business causing end-users to question the integrity of information from which it is based. Common Sense: Tell the truth; if you don’t you’ll eventually get caught in a lie which could potentially cost the company business. Reality: Lying is considered an acceptable form of behavior. In other words, say or promise anything to secure a contract. Let the corporate lawyers figure out later what to do if entanglements ensue. Common Sense: Lead by example. Never ask someone to do something you are not prepared to do yourself. This will earn you the respect of your workers. Reality: Most managers have little sensitivity for the type of work their people have to perform. In fact, they prefer a master/slave relationship thereby elevating their ego. Common Sense: Create an environment that empowers employees and treat them like professionals, thereby giving them a sense of purpose. An empowered employee will be more dedicated and loyal to the company. Reality: Promise recruits anything, sweat them, then let them go at the end of the assignment. Let us also not forget, employees will jump from job to job. Free-agency saw to that. Common Sense: Insist on a clean work environment thereby forcing employees to be more disciplined and organized. By doing so, it will be easier to find and manage things, such as products, parts, and paperwork. Reality: “A cluttered desk is the sign of a brilliant mind” is the normal cop out. By maintaining a pigsty, it is harder for managers to find out what the employee is up to. Common Sense: Plan and set goals, but recognize that change is constant. As such, it is necessary to be flexible to adjust and adapt to changing conditions. Reality: Plans are often cast in concrete thereby making it impossible to accommodate change. If a change is requested, blame the developers of the plan. Oh yea, don’t forget to print plans on fancy paper so it might impress others. Common Sense: Treat problems, not symptoms. To get to the root of a problem, work backwards until you come to the starting point. Still can’t find it? Work forward, from start to end. Better yet, have a second pair of eyes look it over. Reality: Treat symptoms, not problems. Apply Band-Aids where tourniquets are really needed (thereby pacifying the situation for the moment). Companies tend to develop a punchlist of symptoms and than take a shotgun approach to diagnosing them. Further, corrections are rarely delivered for free but, instead, are issued as updates (for a price). Common Sense: Build quality into the product during development. By breaking the development process into stages, the product can be reviewed and inspected in increments. By doing so, it is rather easy to backup and correct the problem upon discovery. A quality-built product requires less time to maintain and, as such, reduces maintenance costs. Reality: Companies inspect products after they have been built, normally by people unfamiliar with the processes and tools used to create the product. The rationale here is that it is seemingly cheaper to discard a product afterwards as opposed to during the development process. The cost of quality is normally bundled into the price of the product, thereby customers assume the price for corrections, not the company. Common Sense: Share and reuse parts of products. By doing so, it reduces development costs and promotes integration between products. Further, it simplifies maintenance of products through the use of standardized parts. Reality: Sharing and reuse is avoided (primarily due to the “Not Invented Here” phenomenon). Consequently, considerable redundancy ensues, both in terms of parts and the labor required to redesign each part. The resulting overhead is buried in the price of the product. Common Sense: The best solutions are the simple solutions. Complicated solutions add to the expense of a project or a product (as well as the time to develop them). Do what is practical, not necessarily what is elegant. Reality: Companies tend to prefer complicated solutions since they tend to pacify inflated egos or as part of a shell game in marketing the product. Complicated solutions inevitably add costs to the product (as well as markups). Common Sense: A team of players can outperform any individual effort. As such, companies should be promoting teamwork and a spirit of cooperation. Reality: Companies offer rewards for individual initiative (not teamwork), thereby resulting in a spirit of competition as opposed to cooperation. The thinking here is along the lines of “natural selection” as contained in Darwin’s theory of evolution whereby the individual with the strongest characteristics climbs to the top of the heap. Common Sense: Technology should be applied in business on a basis of cost effectiveness. An elegant solution to the wrong problem solves nothing. Reality: Technology is purchased by companies to “Keep up with the Jones” or as a status symbol. Rarely is it ever purchased for practical business purposes. Companies have been so conditioned to purchase technology, it is like taking their morning vitamin pill; a habit they believe is good for them. This train of thought is so pervasive today that technology often supersedes management. In other words, we do not try to manage our way out of a problem, we throw technology at it instead (this way, when something goes wrong, we can blame the technology). Common Sense: Do your own work. Give credit where credit is due. Reality: Piracy is an acceptable form of behavior. It is quite common for employees to take intellectual property from one company to another as they move from job to job. Let the lawyers fight it out if a problem ensues. Common Sense: Stay focused on the work product (the result or deliverable) and doggedly see something through to completion with your best effort, thereby creating pride in workmanship. Further, accept constructive criticism so that we can learn and improve. Our goal, as employees, is to become craftsmen in our area of expertise. Let us also not forget that everything begins with a sale. Without a sale, there is no customer service, no development, nada. Reality: People will only work on those items they deem important, in no particular priority. Further, people like to “rearrange the deck chairs on the Titanic” and, by doing so, try to make things look better on the surface than they really are. This is usually done by juggling the books. Companies avoid tackling major projects for two reasons; first, they no longer possess the management skills to accomplish the work, and second; rewards and systems of remuneration are based on a short-term mentality. * Everything begins and ends with the human being. * Business is about people, not numbers. * Information is for people, not for the computer. * We accomplish projects through people. Knowing this, there should be greater respect for the human spirit and, as such, we should be sharpening our people skills as opposed to our technical skills. Technology will always have a role to play, but humans should never become subservient to it. Reality: The human element is too often overlooked or forgotten. Technology is having an adverse effect on our social skills. For example, we can now electronically contact just about anyone anywhere on the planet, but we do not know how to effectively communicate or work with others. Some people believe the ideal business is one run totally by machines and not by people, thereby affording us more leisure time, a sort of “business in a closet.” But as long as we have people as customers, people as vendors, and need people to execute projects, we should always respect the dignity of the human spirit. Some would suggest the Common Sense items listed above are naive concepts; that business doesn’t work this way. They are probably right, but then again, this is what makes “Dilbert” so funny. We all look for Common Sense in the work place, but are no longer surprised when things go awry. 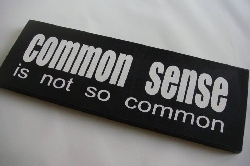 Consequently, these Common Sense items are considered “Uncommon” in today’s world. First published: September 18, 2006. Updated 2019. Excellent article Seldom seen anything about people rationalization. rather flooded by economist demonization. Thank you Tim.